Machines that teach themselves how to cope in difficult situations: this is the next big step in robotics. Dan Scott, Deputy CIO of Vontobel Wealth Management, paid a visit to the Robotic Systems Lab at ETH Zurich. His report illuminates the wide array of things Artificial Intelligence (AI) will be doing for us in the future. The robot "ANYmal" in the premises of the ETH Robotic Systems Lab. ©Vontobel. If one were to measure Siri's intelligence with an IQ test, as one can with humans, the language assistant from Cupertino would not emerge from the process looking especially good: "her" IQ would would be 25, compared with the average of 100 for humans - even humans who are only six years old. In the research laboratory for robotics systems at ETH Zurich, the future of artificial intelligence has already begun. 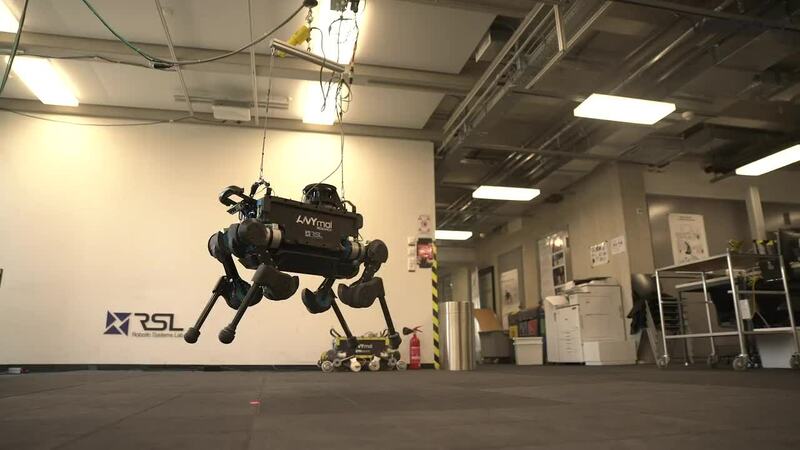 The clever progeny of ETH’s robot family is called "ANYmal", and it stands on four carbon legs and weighs just 30 kg, barely as much as a German shepherd. And just as sure-footed, it can move about in even demanding terrain. Its range of application, however, exceeds the limits of even the best trained of our four-legged friends. "ANYmal" not only assists first-aid teams in rescue operations, but also helps carry out forestry and agricultural work in rough terrain, performs visual, thermal and auditory inspections for industry – and in the classic series "X-Files" has already shone as a movie star. But "ANYmal" is only the beginning. The visionaries of ETH want to penetrate into new areas of society. Find out more in the video report by Dan Scott, shot on site at the ETH's Robotic Systems Lab, where Artificial Intelligence will be the next step in our daily lives. Dan Scott is deputy Chief Investment Officer at Vontobel Wealth Management. He already made a name for himself as a Zurich correspondent for the business news channel CNBC before switching into investment banking. Thanks to his many years of experience in a number of global markets, he is familiar with both the buy side and sell side of the investment business and today advises on investments worth CHF 50 billion. Who are we? How do we live today? And how will digitization change our lives? How the future will unfold is preoccupying society more than ever, with engineers, doctors, politicians – each one of us, in fact – seeking answers. This video feature with Dan Scott is one of many contributions that shed light on the theme "Digitized Society" from a new, inspiring perspective. We are publishing them here as part of our series "Impact".